Appellation or Vine Frascati D.O.C. 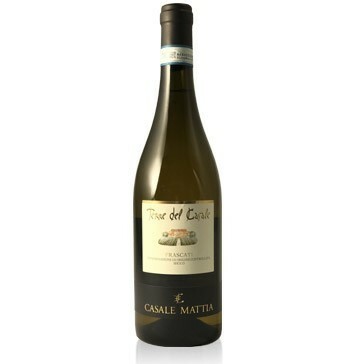 It is considered one of the most ancient Italian white wines. The purpose of Casale Mattia is to express all its tradition and authenticity. For this reason the grapes used for vinification of this product not only come from Malvasia Bianca, Malvasia di Candia and Trebbiano Giallo but also Bombino and Bello, two ancient vines, typical of Frascati. The color is pale yellow, the scent is delicate and pleasant, the taste fruity, soft and velvety. Casale Mattia has been founded by a family that has been working in the oenological field for generations. This choice is due to the aim of bringing back to a new splendor the wines of an ancient territory regaining their prestige and their tradition. The winery is located on the volcanic hills in the middle of Frascati production area, in a land that has always welcomed the cultivation of grapes since Roman age: the large number of ruins located in this farm are still a proof of this glorious past. Casale Mattia vinifies the grapes coming from its vineyards, in a new factory that makes use of the most modern techniques of wine-making. It matches well with all first courses, fish and white meat.